"He is not warm, beloved, or glib in a profession that demands all three. He learned how to hold his own in public, but could never make a good speech or charm an electorate. And that is okay with him. He fits no paradigm, sets no precedent. Which, I suspect, suits him just fine." Bloomberg was raised in Medford, Massachusetts, in a kosher household, but does not practice Judaism as an adult, and as a wealthy bachelor, dates women who are "usually not Jewish" (p. 61). He attended Johns Hopkins University and then got a job on Wall Street. He saw early on the potential of computer-based financial analysis, and made his fortune selling "Bloomberg machines" which became synonymous with "financial news." Bloomberg's non-standard background meant he had to push his way onto the NYC social scene (p. 56) and after accomplishing that, he similarly pushed his way onto the NYC political scene (p. 59). He was a registered Democrat before running for mayor, but got elected as a Republican, and got re-elected as an Independent. The final designation evidently is the most accurate -- Bloomberg considers himself outside the establishment. 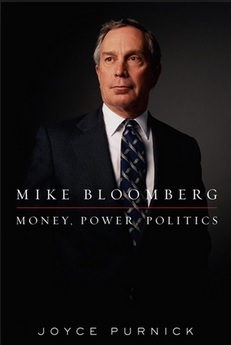 This biography focuses on Bloomberg's three terms as mayor. A full chapter is devoted to Bloomberg's struggles against the city establishment (chapter 9, "Managing City Hall"), which resulted in a huge increase in the school budget and a concomitant increase in student success. Another full chapter is devoted to Bloomberg's biggest failure (chapter 10, "Olympian Dreams"), in which he failed to bring the Olympics to NYC in 2012 (but since New Yorkers never much favored doing so, that failure is credited with his winning a third term easily, p. 153). One more chapter (chapter 13, "Finding Act III") focuses on what Bloomberg will do after his term ends as mayor (in January 2014). The default position is to run his philanthropy, and spend the rest of his life giving away billions, as he has already done for many years now. The biographer makes clear that Bloomberg will not run for president as a Democrat or Republican (he flirted with the idea in 2008, but mostly for publicity purposes). Bloomberg's character, according to this author, is that he will not enter the race if he cannot win; so he will check the landscape in 2016 to determine if an Independent has a chance. Stay tuned! Mike Bloomberg: Supported by women's groups for strong defense of abortion. Mike Bloomberg: 2008: Wall Street executives deserve bonuses. Mike Bloomberg: 1990s: Three sexual harassment lawsuits at Bloomberg L.P.
Mike Bloomberg: Discrimination against blacks means same against Jews. Mike Bloomberg: Rezoning old manufacturing sites led to construction boom. Al Sharpton: Made name as "Sultan of Spin" on Tawana Brawley case. Mike Bloomberg: OpEd: never a conspicuous civil libertarian. Mike Bloomberg: Reduce crime but with a more racially sensitive police force. Mike Bloomberg: Apologizing for police racial errors kept city calm. Mike Bloomberg: Stopped smoking at 30; then became anti-smoking proselytizer. Mike Bloomberg: Dubbed "Mommy Mayor" and "Nanny Bloomberg" for anti-smoking. Mike Bloomberg: Ban the use of cell phones in public schools. Mike Bloomberg: All social problems are ameliorated by better education. Mike Bloomberg: Liberate 1.1 million students from deadly bureaucracy. Mike Bloomberg: Increased school budget from $12B to $20B. Mike Bloomberg: Containerize 12,000 tons of daily trash & export to landfill. Mike Bloomberg: Congestion pricing: fee for driving into Manhattan. Mike Bloomberg: PlaNYC 2030: 25-year plan for pollution & infrastructure. Rudy Giuliani: Reclaimed Times Square from decades of filth. Mike Bloomberg: Visited Israel for first time just before candidacy. Mike Bloomberg: 2008: I know foreign policy from negotiating deals worldwide. Mike Bloomberg: Peace is fragile and democracy is fragile. Donald Trump: Two-term limit on NYC mayor is a terrible idea. Mike Bloomberg: 2005: 8-year term limits; 2009: ran for 3rd term. Mike Bloomberg: Failed to lure Olympics to New York City. Mike Bloomberg: Sued out-of-state gun dealers for selling illegally in NYC. Mike Bloomberg: $500M to Johns Hopkins' Bloomberg School of Public Health. Mike Bloomberg: 2000: Two stents implanted in coronary artery. Mike Bloomberg: 1960s: Rejected as "1Y" when volunteering for Vietnam. Anthony Weiner: 2009: Withdrew from mayoral race rather than face Bloomberg. Bill Clinton: OpEd: MonicaGate sin was self-indulgence, not immorality. Mike Bloomberg: Childhood home included kosher kitchen, but mom bent rules. Mike Bloomberg: Bill Clinton's sin was self-indulgence, not immorality. Mike Bloomberg: Impatient with government; executive ok; not legislative. Mike Bloomberg: Outsider to both Republican and Democratic establishment. Mike Bloomberg: Self-made billionaire from financial information company. Mike Bloomberg: 1940s: Raised in Medford, reached Eagle Scout at early age. Mike Bloomberg: OpEd: Stiff in public; impatient with retail handshaking. Mike Bloomberg: Candidates' religious beliefs should be kept private. Rudy Giuliani: After 9/11, sought term-limit extension of three months. Rudy Giuliani: OpEd: actually governed the supposedly ungovernable city. Mike Bloomberg: Raised property taxes to 18.5%, highest in history. Mike Bloomberg: 2004: Refunded $250M to residential taxpayers, not business. Mike Bloomberg: 1979: On Wall Street at dawn of the computer age. Mike Bloomberg: 1981: Invented "The Bloomberg terminal" for financial news. Mike Bloomberg: 1960s: No burning passion to go war, but it was expected.